As a schoolboy I was keen on kayaking and was tickled by a cartoon depicting a kayak on dry land trailing a dust plume with the caption Kalahari Canoe Club! I kept that on my wall for years. Kayak’ing in the desert was just a joke, right!? 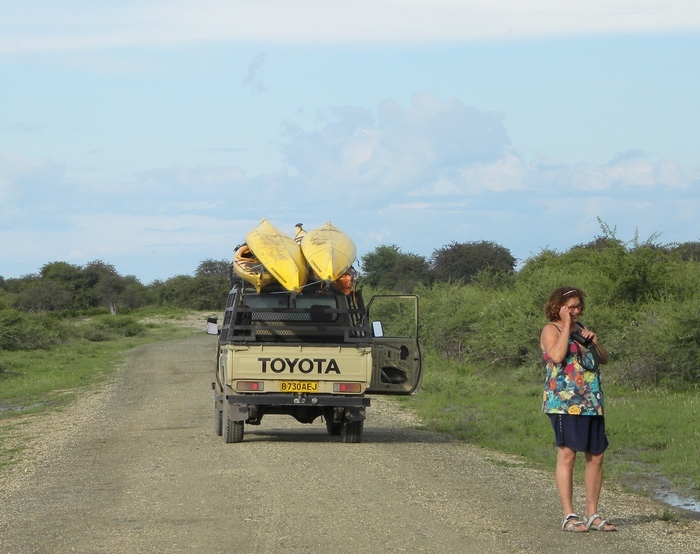 In January 2010 we got to the Kalahari to hear the Nhabe River was flowing strongly into Lake Ngami and Aitch’s twin sis Janet and boyfriend Duncan had organised us kayaks! Hey! 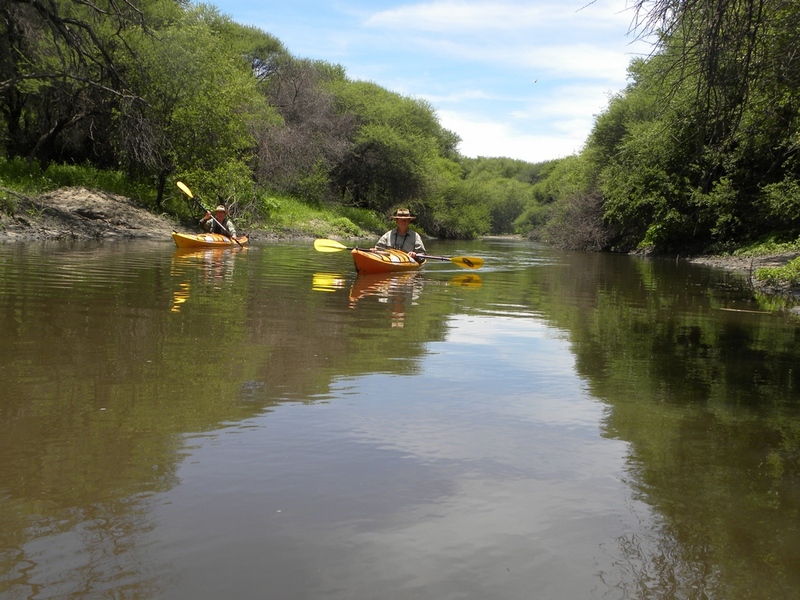 Maybe you really could kayak the Kalahari! 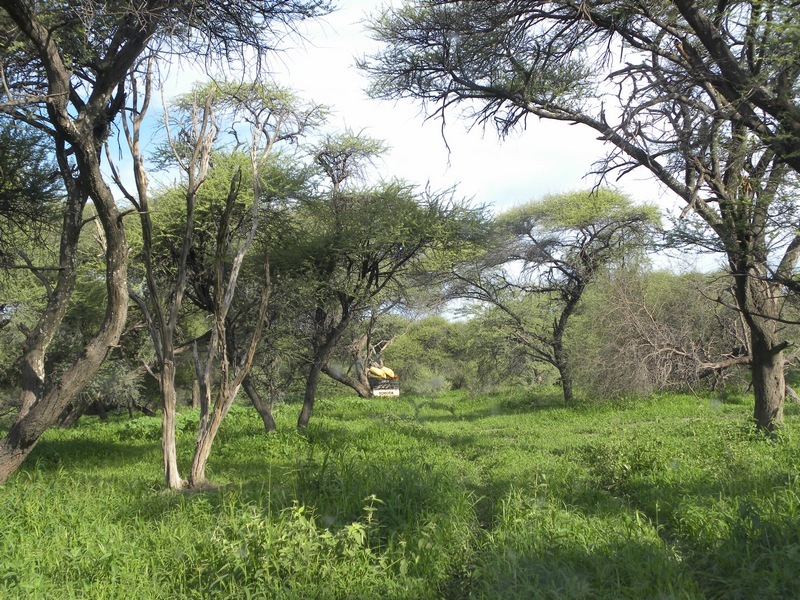 A reconnaissance trip to the area with GPS found us a put-in place where we could launch – no easy task as this Kalahari “desert” was knee-deep and chest-deep in green grass after the good rains. 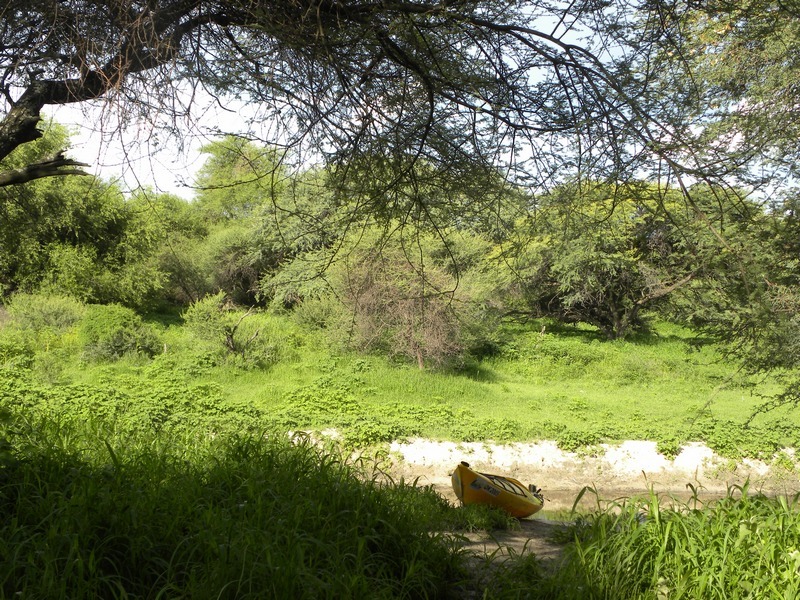 We returned the next day with two vehicles and four yellow kayaks and set off on the beautiful river, flowing nicely between overhanging trees: Paradise, with plants, flowers, grasses and birds all putting on a spectacular show. Five Giant Eagle Owls peering down at us blinking their pink eyelids from one thorn tree was special! As was a big green snake, I guessed over 2m long that came towards me on the bank as I drifted towards it. I was amazed it kept coming. 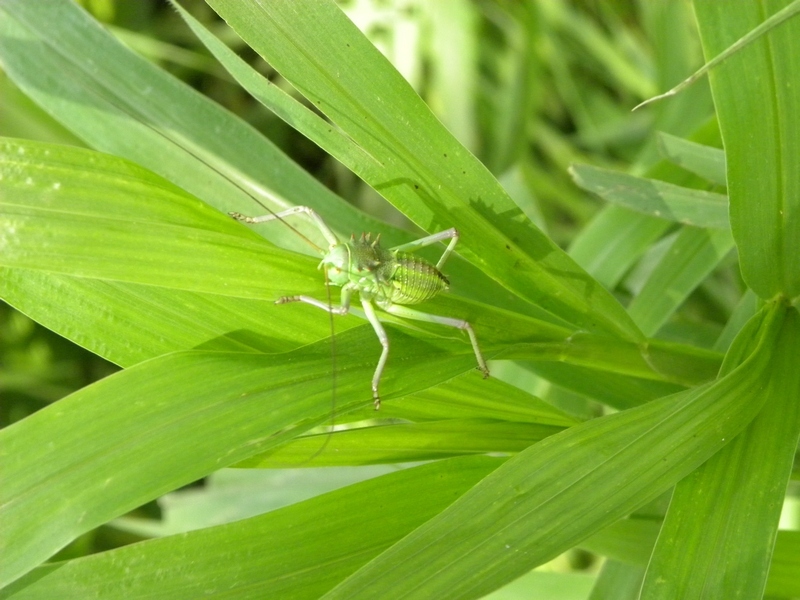 When my kayak’s prow beached it still came on up to about a metre away, grabbed a small shrub in its mouth and only then beat a hasty retreat. A Kalahari Vegetarian Viper? I was thinking till I heard a loud hiss and saw the big flap-necked chameleon he had caught (together with some leaves) in his mouth. I had missed seeing a chameleon in that tiny green shrub! My guess is he was an Angolan Green Snake. Another memorable sight was rounding a bend and seeing four cows drinking: One all-black, one all-brown, one all-white and one all-tan. They looked so striking against the lush new green backdrop that we remembered the camera but we had drifted past in the current and by the time we paddled back against the current they had dispersed. Lunchtime we ate on the bank sitting on the kayaks. I remember hardboiled eggs and very tasty sarmies. The girls then turned back as the paddling would be much slower against the current while Duncan and I headed on, determined to get into Lake Ngami. And we did. How spectacular! The trees fell back and the sky opened up and huge reed beds stretched in every direction. Fish eagles cried, ducks scattered before us and herons and cormorants and waders were all over the place. At first we were still in a channel, but after another kay or so we could branch into other channels and lagoons out of the main current. Way too soon we had to turn back to get back upstream to the girls and the vehicles. Guy Upfold got a shot of cattle wading in Lake Ngami as it was filling up after rains – I use this to show what it looked like when we got out of the river into the lake. He’s a bird photographer, so he called the shot ‘waders’ – I liked that! This is a trip crying out for a multi-day one-way expedition with seconds collecting you at a take-out point on the lakeshore. To do it though, you have to be free to leave at short notice on those rare occasions when the river is up. 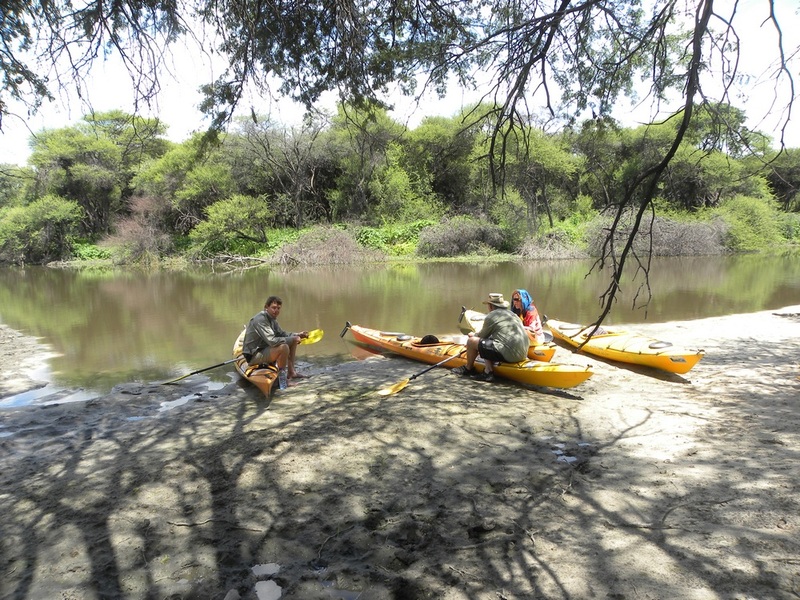 Or else you’ll be reviving the old Kalahari Canoe Club – with plumes of dust!